Mill House Window Workshop - Sash Window Restoration - Sash Window Repair - Sash Window Draughtproofing - Replacement Sash Windows, covering Hertfordshire, Bedfordshire, Buckinghamshire and South Cambridgeshire. - Finally, we coat any external bare timber with a clear primer preservative that contains a fungicide and insecticide. Where possible we use traditional materials such as lime mortars and prefer to renovate or repair rather than replace. We are able to supply double glazed units that will fit into the existing rebates of most traditional sash and casement windows. Unlike conventional sealed units ours only require 6mm wide rebates, and the units are only 10mm thick yet meet current building regulations with a value of under 2. 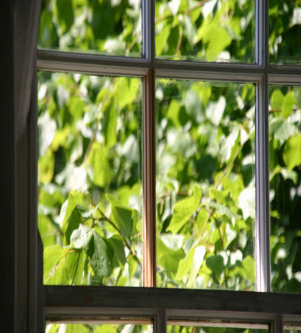 For windows that are less than 38mm thick we are able to offer new sash inserts with double glazing. These replace your existing sliding sashes. These have a traditional moulding that will closely match your original windows, and we are also able to match the decorative horns on your original sashes. Sash inserts come fully painted. Our double glazing uses individual units for each pane, we do not use stick on bars. Whether you require new windows, or where unsuitable replacement windows have been installed, or in the very rare cases that a window is beyond economic repair we can provide new sash windows to match the originals. Painstaking attention to detail results in a reproduction window that performs as well as or better than the original. Our windows are very different to the "off the shelf" modern windows that usually look inappropriate. Our special double glazing units also allow us to use thin glazing bars to match the original profiles used in Georgian and Victorian windows. Windows can be supplied, single or double glazed, with traditional weights and pulleys, and in a selection of high quality timber. All windows are made to order and to your exact specification. We do not have a "standard" window design or profile that we mass produce.